The dispensing tip, needle or nozzle is an important part of the application system selection process. It is the point of exit and plays an important role in controlling the deposit. Selection should be carefully considered in relation to material and type of deposit required. Please contact us for advice, or to request a dispensing tip sample pack. 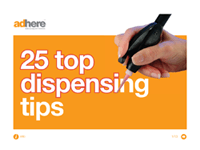 An invaluable list of do’s and don’ts for liquid, fluid and paste dispensing, to help you achieve optimal processes. Blunt end stainless steel dispensing tips are our most popular type of dispensing tip. They can be supplied in different gauges (I.D.) and lengths and in angled or crimped options. 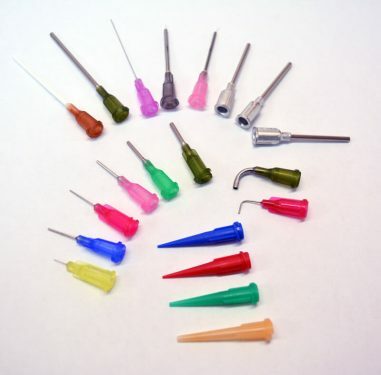 Flexible dispensing tips are polypropylene needles bonded to colour coded hubs. They provide an ability to dispense in hard to reach areas. PTFE lined dispensing tips are recommended for dispensing cyanoacrylate adhesives or other low viscosity materials. These stainless steel tips are lined with a Teflon (PTFE) coating and bonded to a colour coded hub with luer lock fitting. Preci-Tip™ Precision Dispensing Tips or Nozzles are designed for accurate dispensing of dots or beads. Their streamline conical fluid path delivers considerably higher fluid flow rates and lower dispense pump back pressures than most standard dispensing tips. This results in improved dispensing accuracy and component life. The thin wall nozzle cores are produced using the deep drawing process, giving particularly low resistance to fluid flow, and exceptional accuracy and robustness compared to plastic dispensing tips or nozzles.